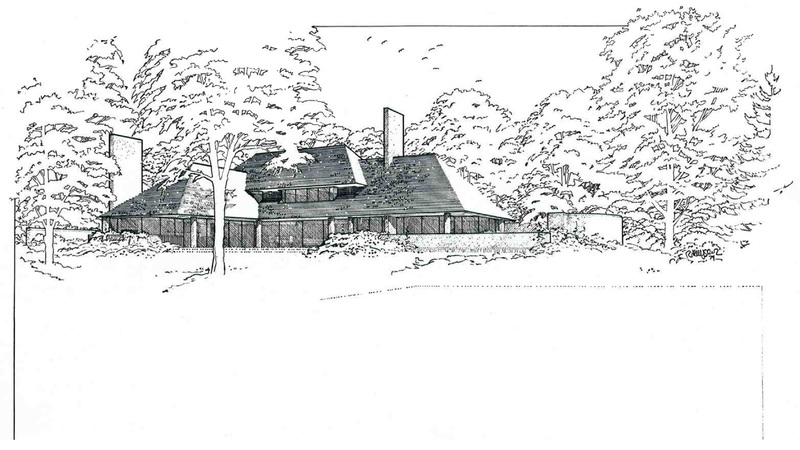 This week’s blog post deviates from featuring a specific building and focuses instead on the tool we as architects use to conceive, develop and illustrate our work—drawings. Researching and going through files preparing for each week’s article, I have been struck by the volume and quality of the drawings in the firm’s archives and thought they deserved their own blog post. This post addresses the perspective concept renderings used to develop architectural concepts and details and to illustrate these ideas for the clients. Constructed and rendered by hand originally and now by computer, these drawings are very personal expressions of each design and their character and details are particular to each architect. Prior to the widespread availability of computer software for three-dimensional modeling of architectural design, traditional training of architects included the construction of perspective drawings, a necessary tool for the illustration of their designs. Some students became extremely skilled at this and developed individual rendering styles. As I previously noted in the early blogs, Rem Huygens, founding partner of our parent firm Huygens and Tappe’, was influenced by the work of Frank Lloyd Wright. Rem, of course, found Wright’s drawing techniques compelling (who wouldn’t?) and as he developed his own style one can see trademark Wright characteristics in his perspectives. For instance, drawings characteristically were made entirely in pencil and constructed in a manner that emphasized the relationship of the buildings to their settings. Lines outlining building walls turned uninterrupted into ground planting. Or sometimes the subtle elimination of a line at the base of a wall allowed wall surfaces to blend into the ground. Perspectives were often framed with a single line that ran from a piece of the landscape around the top of the rendering connecting background to foreground and pulling the eye to the main focus—the building. Rem’s drawing style was consistent from building to building and, like some of Wright’s, distinct in solely using lines to create the entire drawing, including shadows and textures. 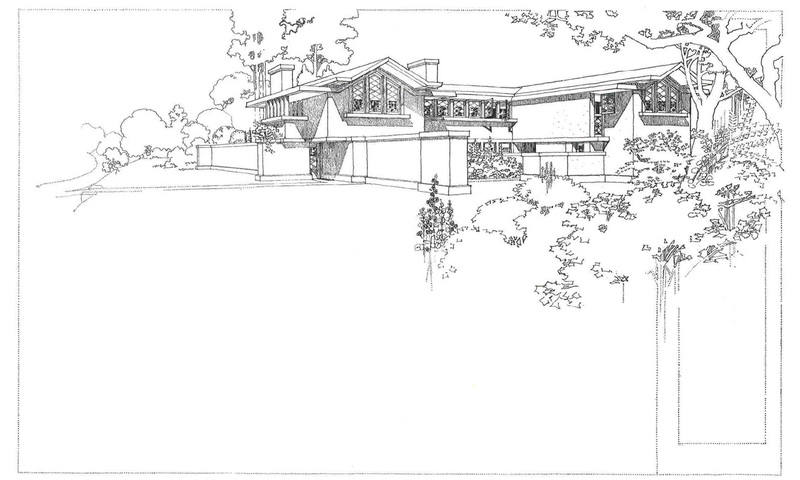 An early Wright rendering showing pencil techniques for foliage, “framing” rendering and parallel pencil lines for shadows. In the early years at Huygens and Tappe’, most of the firm’s perspective renderings came from Rem’s hand. 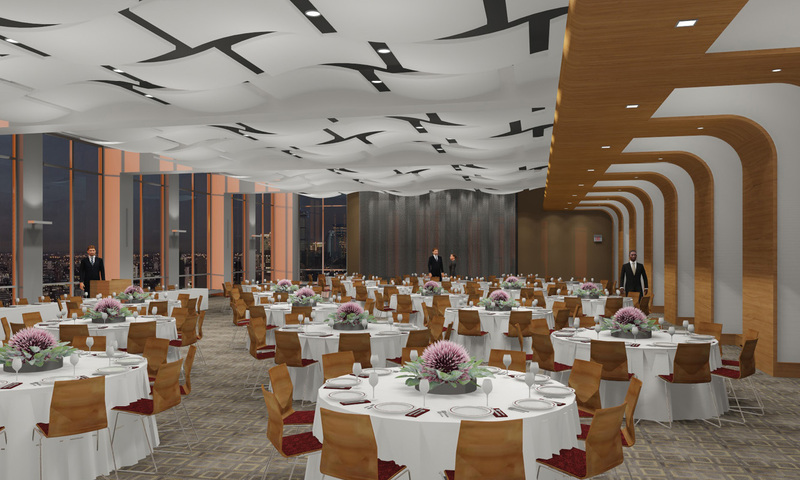 These were detailed and precise renderings that were created when schematic design was done and they quickly established a “signature” to the firm’s work. They were used not just to illustrate the building to the client but to instruct the young designers in the firm on exactly how the building was to be crafted as more detailed construction drawings were done. 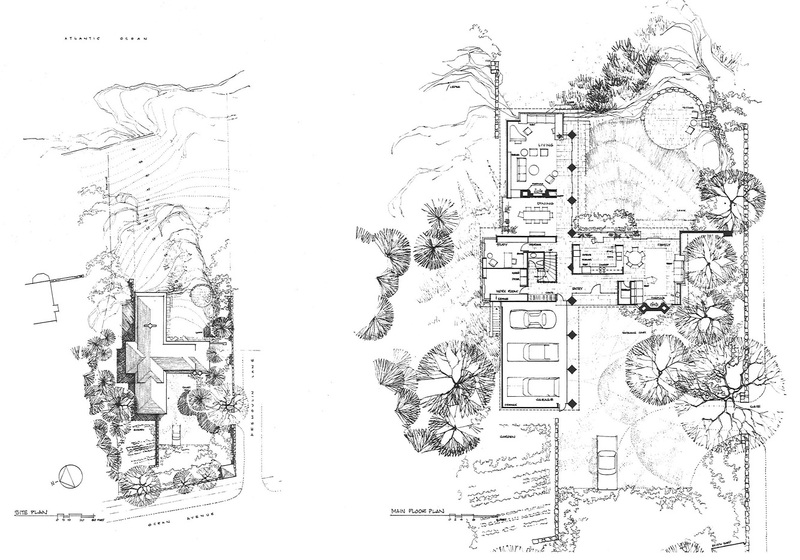 One can appreciate, when the perspective renderings were viewed together with their respective floor plans, how fully developed were the design ideas at this early stage in the process. Proportions had been determined, materials established, details of siding (mitered corners), soffits (cedar boards), window mullion locations, were all shown. Furniture arrangements were entirely thought out, including an ample amount of built in cabinetry. When staff would subsequently develop more detailed drawings for construction, there was constant reference to these schematic drawings for instruction on how the dimensions, profiles and proportions of the construction documents were to be set. As one looks through the years of these renderings it is interesting to observe how Rem’s drawing techniques evolved as he matured. There is a density of line work in his early renderings that gradually diminishes in later drawings. Over the span of his work there is a remarkable efficiency that he developed, where with fewer lines, he gave each an increasingly important role in the overall composition. Like many artists, Rem’s confidence in his work was expressed increasingly with the abstraction and simplification of his drawings. If you compare the rendering of the Huygens Chalet (1965) to that of the DePietri House (1990), the simplification of technique is very apparent. 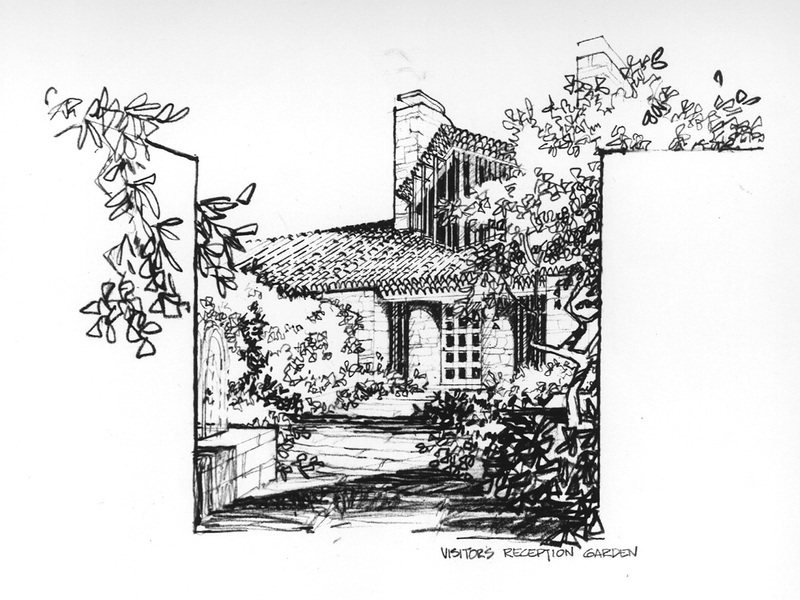 Each drawing is a complete depiction of the design, with materials, window frames, doors, soffits, chimney shapes all fully defined. DePietri accomplishes this with far fewer pencil lines. Rem was meticulous about the preservation of his renderings and late in life he assembled the body of his work and donated it to Historic New England. It is a wonderful collection. 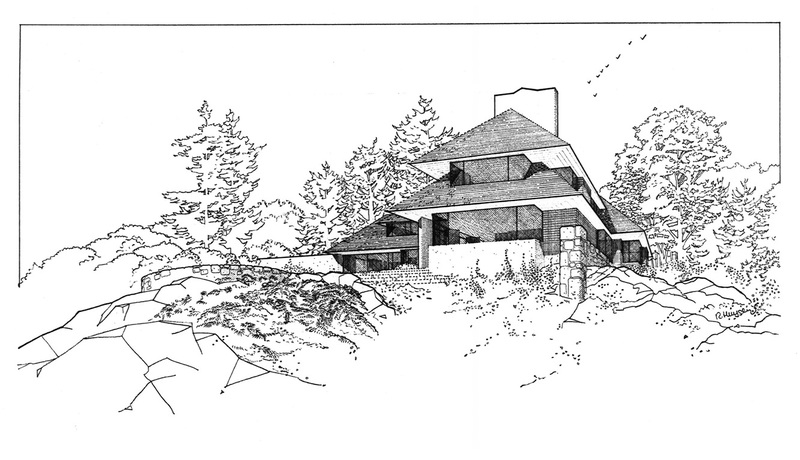 Density of line work on an early rendering (Huygens Chalet) and minimal lines on a later rendering (DiPietri House) exhibited a confidence of the designer. As the firm grew and took on larger projects, a young very talented architect, Terry Cracknell, rapidly gained the confidence of the partners. They quickly employed his skills in the development of project designs and ultimately their illustration in a wide range of presentation drawings. Terry was the “go to” person when another staff member may have been struggling with a design problem. He was not only capable of easily visualizing and sketching projects in three dimensions, he also was capable of illustrating the designs in compelling and complex renderings. Terry was a skilled colorist and advanced the firm’s rendering techniques in full color. 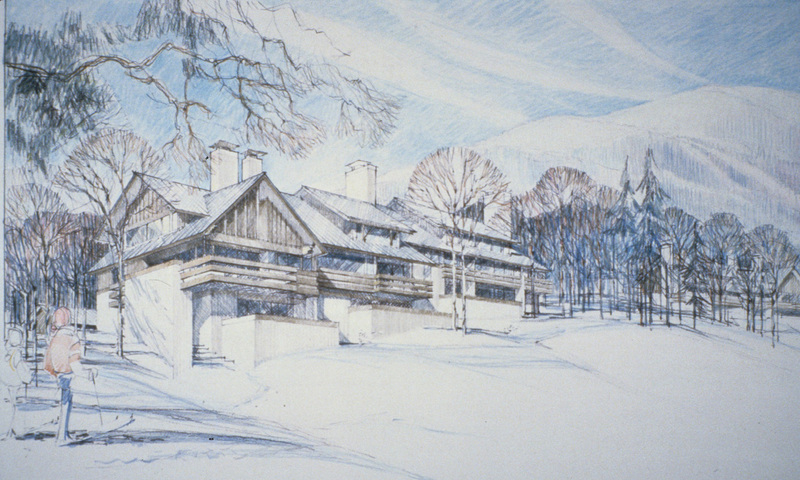 Terry’s “style” of drawing is also unique and recognizable even today (long having his own rendering practice, he still occasionally provides renderings for other architects) for their bright and yet softly seductive quality. Like Rem’s growth towards a simpler and more abstract rendering style, one can see Terry’s later work grow looser and less dense. Mount Mansfield, Stowe, VT 1982. Terry’s early work was mostly in colored pencil and similar in style to Rem’s renderings in that it relied primarily on line work. The Polo Club, Narragansett, RI 1984. Terry moved to more saturated colors using pencils and line work that he began to blend with his fingers and an eraser. Vernon Court, Newton, MA 1991. By the mid 1980s Terry had added watercolors to his palette for better saturation and began to reduce the amount of line work with edges often defined by a change in color. Guangzhou Urban Plan, China, 1993. 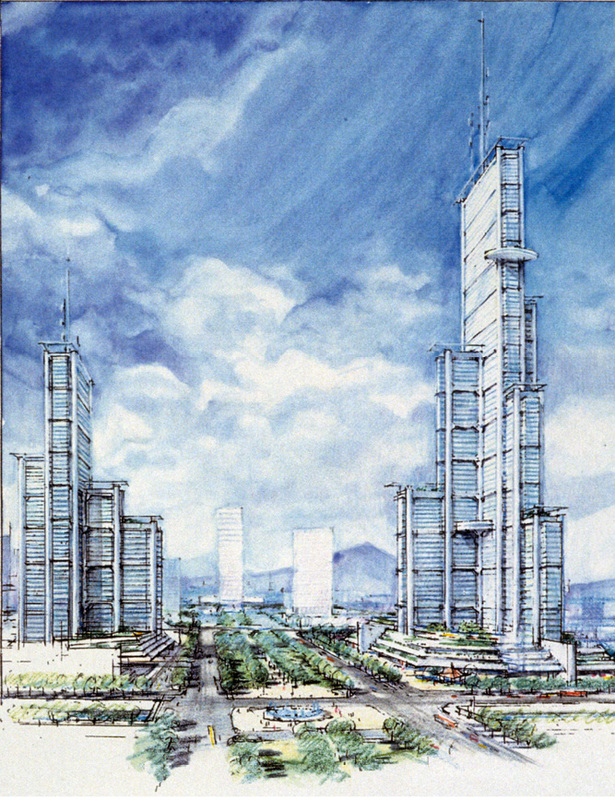 As part of a master plan for Guangzhou, Terry illustrated the iconic towers of the proposed financial district capturing the image of the new China. Szeto Villa Yacht Club, China, 1995. As mentioned above utilizing watercolors Terry’s style became more fluid with very little line work layering colored pencil over the watercolor washes. Note the openings are just a brush dabbing of cerulean blue yet the character of the buildings is completely understood. Construction of an accurate perspective drawing takes time, separate from the time given to conceptualizing the ideas that are reflected in the perspective. Because early concepts are often not fully envisioned, a useful skill is the ability to quickly sketch ideas “freehand” in perspective. Most architects, trained prior to the age of CAD, learned this skill, so through a combination of drawing floor plans, elevations, cross sections and free hand perspectives, architects created their initial, or “schematic,” design concepts. Only when the design was fully enough advanced, was an accurate perspective rendering such as those illustrated here, created. It took so much time to create accurate perspective renderings that few were made for each project. All of this changed with the advent of 3D CAD modeling. Today’s designers have powerful digital tools that allow them to simultaneously test ideas and see them accurately in 3D from an infinite number of viewpoints as they are first explored. Because so much can be seen so quickly, a dramatic increase in productivity allows for a wide variety of ideas to be tested within a relatively short time. The previous 3D “sketch” has now become the basic way to express concepts. When architects previously drew floor plans or elevations, they had to imagine what those drawings represented in three dimensions and sketched perspectives accordingly. Now the computer does this for you and each wall, window, roof or floor plate you draw automatically exists in 3D. When fully developed, one can actually construct an entire building, with all its component parts in a digital model (called BIM for building information modeling) and look at the shape, color, size and location of each door knob if you wish to. We are now accustomed to “virtual reality” presentations, ultimately becoming so highly developed that viewers are able to experience the buildings as they would in real life, inserted into the specific environments where they are to be built. In fact, early in the decade I had a rendering done by Terry for a client and the client requested that the drawing be a little sharper. I clarified the client’s intention which was they eventually communicated to be more realistic. When asked Terry for some tweaks to the drawings, he suggested that I hire “a professional renderer” clearly communicating what he provided and that there was transition in client expectations that needed to be addressed. These powerful tools are allowing architects to see and share their design ideas more freely than ever before. And the tools have enabled far more complex structures to be designed and built. Hotel Pevero, 1972 Sardinia Italy.